Sales of SAP software and related services grew 35% and 25% respectively during Q4 2010, compared to the same period in 2009. 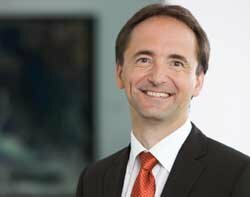 Werner Brandt, CFO of SAP, said, "We finished 2010 with the highest fourth-quarter for software revenue in our history. Our strong performance and our business outlook for 2011 demonstrate that SAP is confident about achieving double-digit growth and continued margin expansion." However, the company's operating profit has been hit by the TomorrowNow dispute. Reporting its Q4 2010 results, the company said, "SAP believes that the amount awarded by the jury in Oracle v. SAP/TomorrowNow is disproportionate and wrong. After the court has entered final judgment, SAP intends to file post-trial motions in the coming weeks asking the court to reduce the amount of damages awarded, or to order a new trial. Depending on the outcome of the post-trial motion process, SAP may consider an appeal." Jim Hagemann Snabe (pictured), Co-CEO of SAP, said the company would drive forward innovation, such as on demand and in-memory computing. "We are convinced that these new innovations will help us drive double digit growth and reach 1 billion users by 2015." Nottingham County Council is among the organisations that began a major SAP implementation in Q4 2010.